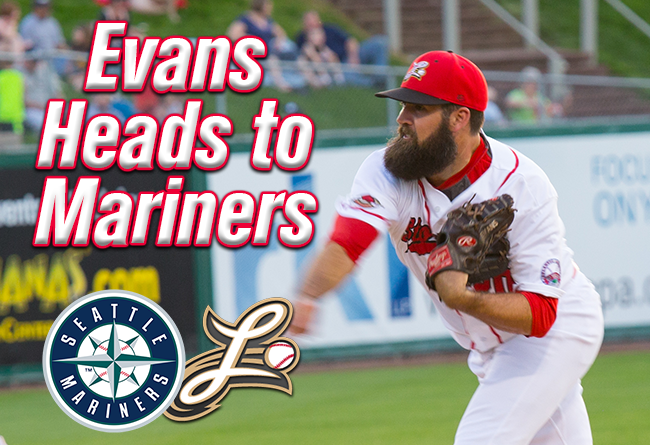 (Lancaster, Pa., July 31, 2017) - Right-handed starting pitcher Bryan Evans’ contract has been purchased by the Seattle Mariners Saturday evening. He will head to Class AA Arkansas in the Texas League. Evans was scratched from his Sunday start at Southern Maryland. Manager Ross Peeples filled the slot, using six relievers in the Barnstormers’ 4-2 win over the Blue Crabs. In 17 starts this season, Evans had posted a 6-3 record and 5.05 ERA. The right-hander had won five of his last six decisions, and the Barnstormers had a club best 12-5 mark in his starts. For the second straight season, the Mission Viejo, CA native had an impressive strikeout/walk ratio with 92 K’s in 92.2 innings to go along with only 19 walks. He leaves the Barnstormers as their fourth leading career strikeout artist with 247. Evans holds the single season mark at 130 and shares the one-game mark with 13. Evans has been Lancaster’s Opening Night starter for each of the last three seasons, going 1-1 with a no decision in this year’s 2-1, 10-inning loss at Somerset. However, he has not lasted any of those three seasons in Lancaster. Colorado purchased his contract after just five Atlantic League games in 2015 and assigned him to Class AA New Britain where he was 6-5. Seattle also purchased his contract in 2016, sending him to Jackson, TN, their Class AA affiliate at the time. With the signing of Evans, the Barnstormers have set a franchise record by having 10 player contracts purchased by Major League organizations in one season, breaking the old record of nine, set in 2016 and 2011. His is the second contract purchased by the Mariners. He will join second baseman Jeff Kobernus in Arkansas. Evans’ spot on the roster will be filled by right-hander Joe Gardner, who returns to Lancaster on Monday for his fourth partial season with the Barnstormers. Gardner has a career 15-9 record in Lancaster.